Most PON families are experienced dog people, but it is always helpful to hear new advice and follow through on valid suggestions. The first thing families will need to cope with when they take their new PON home is the stress the puppy will encounter on leaving the familiar surroundings and conditions of it's maternal home. Most PON puppies are inquisitive, and unless the puppy is overawed by new surroundings, he will wish to explore furniture, etc. The best advice is to leave him to his own devices to explore and show the pup that his new home is welcoming and he/she has nothing to fear. 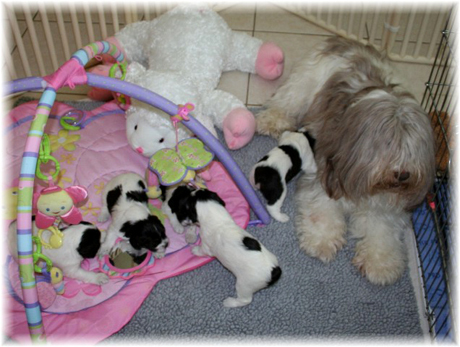 Children need to be supervised very closely to avoid over stimulating the pup. In most cases, a PON puppy's first night in his/her home may be disturbing to the family because of insecure behavior. Please keep in mind that suddenly being away from his mother and brothers and sisters is a new experience and the pup may be confused and frightened. Try placing the PON's bed in a quiet room, making sure there are nothing like lamp wires and other objects that he might fall or tip over, or furniture that he might chew. A good tip is to put an alarm clock wrapped in a towel, as well as toys, in the puppy's bed. The alarm clock will make a comforting noise, and your new PON puppy will not feel that he is alone. Your puppy is apt to feel stress because of the complete change in his environment. You can make him feel secure, and give him lots of love (cuddles) and plenty of time to adjust. The most visible effect of this stress will probably be an upset stomach. These symptoms are quite usual in sensitive intelligent PONS and will be observed in your puppy's normal playful behavior. If this does continue, take him or her to the vet. In any event, a vet's visit is advised for all new puppies. It makes good sense to have your PON puppy microchipped as a safety precaution, so that if it is lost or stolen, it can be scanned and the puppy quickly returned to you. Chew toys provide excellent mental stimulation and help keep your PON's teeth clean and allow it to exercise it's jaws. Select toys for your PON carefully because some may be too small and some may splinter with excessive chewing. Your puppy needs a range of appropriate toys to play with in order to avoid chewing on furniture and other household items. Consider interactive toys such as balls on ropes and frisbees which are fun for both owners and PONS. Avoid allowing your puppy to play with sticks, golf or squash balls because they can easily become stuck in a puppy's throat and cause damage or even death. Please consult your breeder about grooming equipment and the best types of brushes and combs. You might wish to purchase a grooming table and start brushing your PON on it from an early age. Always brush your PON slowly and gently in order to introduce the concept of grooming in short sessions. If your puppy tries to bite the brush, consider some taste deterrent on it so the puppy learns not to bite the brush. Tooth brushing is an important part of grooming and may help prevent gum disease. Start brushing early and use special canine toothpaste which comes in tasty flavors. Generally speaking, puppies require considerably less exercise than adult PONS and great care needs to be taken to prevent overtiring puppies and preventing damaging young puppy joints. Exercise should take place on a daily basis and time spent playing in the yard is not a substitute for walks. In summary, consult your breeder and vet for the best PON puppy care and use common sense when it comes to exercise, diet and socialization.